Having completed the 4th London ACC and the Rehabilitating Power of Choice Professional Course, L. Ron Hubbard scarcely paused in his program to enhance auditor skill. Its next phase was hands-on training on the latest processes, concurrently sending auditors into the field to sharpen their skills. Known as the London Auditors Meeting lectures, here is the development of the most fundamental processes later contained in the book, Scientology: The Fundamentals of Thought—processes to begin the cycle of clearing in any zone. They embrace everything from two-way communication—in particular the most broadly workable technique for a low-level case—to an entire lecture on matching auditing to tone. Here, too, is a definition of havingness in terms of postulates, the relationship of havingness to cognitions and the difference between repair and remedy of havingness. While toward even broader understanding, Mr. Hubbard defined processing as the means to improve the ability to play a game. Moreover, to further equip auditors, he provided the know-how of dissemination, teaching three proven methods for procuring new preclears. 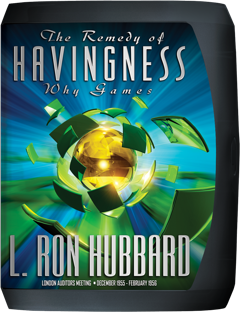 Here, then, are the basic and powerful truths on how to increase a being’s ability to create the joy of a true game. The way to be at liberty in this life is to be able to have or not have this life at will. To be able to have or not have bodies, space, environment, planets, mock-ups, anything. You get the idea? At the start of December 1955, L. Ron Hubbard had just completed delivery of the 4th London Advanced Clinical Course, the Rehabilitating Power of Choice Professional Course and The Lindsey Theatre Lectures. Yet despite the intensive schedule, he wasn’t pausing even for a moment. For with Scientology continuing to grow rapidly—now active on four continents and thirteen major countries—the need for expert auditors was paramount. And with London still the capital of the British Commonwealth of Nations accounting for 25 percent of the world’s population, the city formed a major launch point to accelerate that expansion. Thus, Mr. Hubbard continued forging ahead with his program to enhance auditor skill, beginning on 1 December when he inaugurated a series of weekly evening lectures intended to keep auditors up-to-date with instruction on the latest processes and their use: The London Auditors Meeting. Yet, if the setting might have appeared less structured than, say, an Advanced Clinical Course, the data was immediately relevant not only to a session, but in life. For what L. Ron Hubbard was imparting were golden nuggets of technical application to take away and use: how to establish two-way communication with any case, the difference between two-way communication and allowing the preclear to just talk, even the importance for a successful session of greeting preclears on their arrival—and all this from the very first lecture. “Exteriorization versus havingness. A chap can be as able as he is capable of leaving a game and coming back to it, by the way, and that’s an exteriorization. No-Game Condition—what it is, how it occurs when one wins or loses completely, and its eradication with auditing. All of which is to say: The goal of processing is toward the ability to play a better game—the game called life. And, as he described, that is where the preclear is going. And in that very spirit, presented here are the basic and powerful truths on how to restore a being’s ability to create the joy of a true game.